Shopping for a new Dodge Grand Caravan? The Dodge Grand Caravan won’t be around past 2019, so buy an SXT while you can—or save more for a better, more protective van. The 2019 Dodge Grand Caravan presents a first-world dilemma. We want low prices and nice things, and in another day and age, this minivan would solve that conundrum. 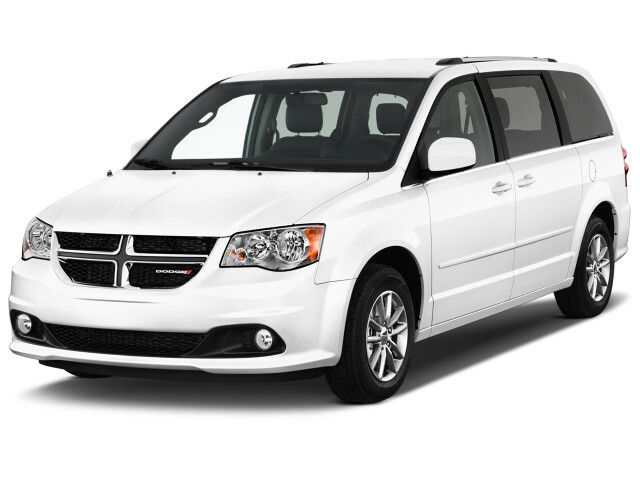 But with the Grand Caravan, Dodge has aged out of the minivan system. Younger, prettier, more talented vans have come—and gone, and come again. No matter whether it’s sold in SE, SE Plus, or SXT trim, the Dodge Grand Caravan no longer offers anything but a low price to shoppers, and its crash-test scores give us deep concern. With a basic shape that dates to the 1980s, the Grand Caravan’s most recent facelift came in 2011. It’s resolutely angular in a way Chrysler’s newer Pacifica is not, and that shows the Caravan’s age almost as much as its interior. The cabin’s plastered in inexpensive plastic and cloth—fine, if it’s a bare-bones family appliance, less pleasing once it flies past $30,000. A 283-horsepower V-6 couples with a 6-speed automatic for very good acceleration, but fuel economy lags the pack of minivans, and so does handling. The Grand Caravan suffers from a bounding ride that transmits a lot of noise into the cabin. Base Grand Caravans have a third-row fold-away seat, but a second-row fold-away set of captain’s chairs are the sole reason to buy this van other than price. Tuck all the seats you can and the Grand Caravan’s vast cargo hold makes for a good commercial vehicle, which it has been in past lives. 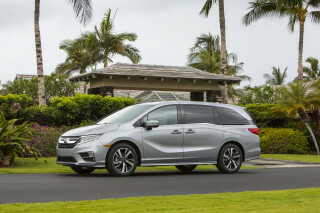 Safety scores from the IIHS are among the lowest of all vehicles, and the 2019 Grand Caravan lacks the latest safety features. Only the Grand Caravan SXT has features such as rear-seat entertainment and leather upholstery, while its minivan competition has gone on to plug-in hybrid powertrains, airline-style seats, and in-car wireless internet. The 2019 Dodge Grand Caravan has outlasted many new vehicles, with its no-frills looks. The 2019 Dodge Grand Caravan offers a view into the distant past. Its basic shape can be traced back to the 1983 model year. 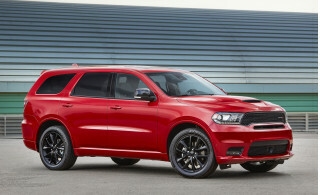 If minivans were as hotly sought after as Porsches, this would be Dodge’s 911. But it’s not, and instead the Grand Caravan has begun to fade into the background with its boxy shape, and its blocky cockpit does it no favors, either. 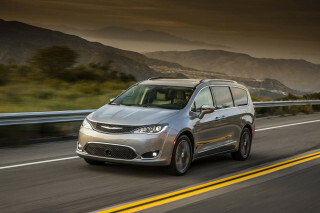 It may seem harsh to score the effectively plain Grand Caravan so low, but a look aside at the Chrysler Pacifica shows how attractive minivans can be. The Grand Caravan, after all these years, now looks tall and narrow and slab-sided. It’s especially drab on base SE steel wheels. The cabin doesn’t relieve the downwardly mobile look much. The tall center stack and standard-issue control sets sit in a sea of black or dark plastic, and velour. There’s smart organization and a blessed lack of frippery when it comes to the function of the Grand Caravan’s controls. 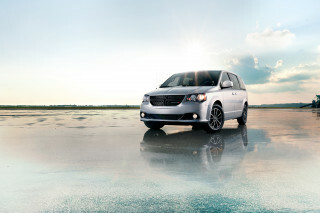 But we’ve really seen it all before, and the Grand Caravan’s a long way removed from its last real facelift. 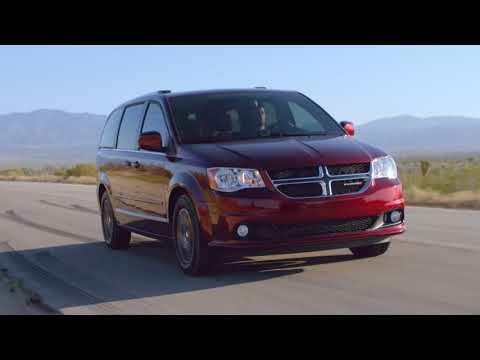 Dodge fits the Grand Caravan with plenty of power, but hasn’t tamed its ride as well. The 2019 Dodge Grand Caravan competes well in the powertrain arena, but its aged suspension design can’t keep its body under the same genteel control as a Sienna or a Pacifica or an Odyssey. All Grand Caravans sport a 3.6-liter V-6 with 283 hp and 260 lb-ft of torque. It can propel the minivan with authority, and it’s reasonably quiet, too. A 6-speed automatic shifts power to the front wheels and offers no substantial complaints. The powertrain duo does resonate some at middling engine speeds, but the gusto it applies to the front wheels from launch makes up for that moan. What the powertrain gives, the steering and suspension take away. There’s torque steer, in which the copious power overwhelms suspension geometry and tugs the wheel in unwanted right or left pulses. The Grand Caravan’s 17-inch wheels deliver a fairly firm ride, which rattles some interior trim and sets up a bounding motion in the rear wheels that the Grand Caravan can’t quite quell. The steering takes direction well, but the imperfections that make their way through to the cabin set up an odd confrontation. The Grand Caravan should ride more smoothly over slight bumps but doesn’t, and it can’t damp out bigger road humps particularly well, either. A few miles behind the wheel of a Chrysler Pacifica shows how it can, and should, be done. The 2019 Dodge Grand Caravan has a boxy, deep interior that’s great for hauling cargo and people, but the seats can feel cheap. 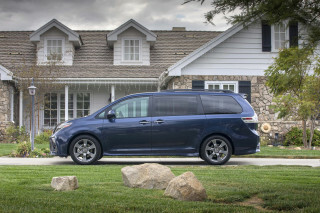 Flexibility has been the calling card for minivans since they were invented in 1983. The Dodge Caravan led the march then, and it’s still the most gymnastic of family movers. In front, the Grand Caravan gives its passengers a high seating position, decent adjustment, and excellent outward vision. The Grand Caravan sports a cloth interior and fold-away third-row seats in its most popular editions. Keep in mind that base minivans only have a second-row bench seat that does not fold into the floor; the tuck-away captain’s chairs cost extra. 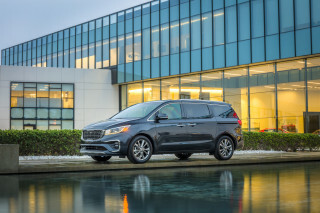 To us, they’re the only reason to consider this bargain-priced minivan, but some find their comfort lacking, as do some drivers who sit in the velour-covered front seats for hours on end. There’s value pricing, then there’s cheap, and the base Grand Caravan treads that line very carefully. Its inexpensive build quality shines through the gloss of some of the door plastics, and most of the trim behind the driver seat. It’s aggressively budget-grade, and makes sense if it’s only going to be ruined by pets and kids. Of course, by those guidelines, our very lives should be upholstered in vinyl, but that’s a subject for another day. The Dodge Grand Caravan scores worst of all minivans in crash tests. The Grand Caravan earns a four-star overall score from the NHTSA; in subtests such as side-impact protection, it actually scores quite well. In the IIHS tests, it earns “Poor” scores for important tests such as the driver-side small-overlap test. The Grand Caravan also doesn’t offer any of the latest safety advances, such as automatic emergency braking, adaptive cruise control, or lane-departure warnings. It can be equipped with blind-spot monitors and rear parking sensors. Come to the 2019 Dodge Grand Caravan for its low price—and don’t spend more. Low, low prices are the 2019 Dodge Grand Caravan’s reason to exist. A much better minivan exists across the showroom wearing Chrysler Pacifica badges, but it costs thousands more. Dodge at least fits the Grand Caravan with some decent features in the upper SE Plus and top SXT trim, though it ditches some nearly essential features in the spartan SE spec. The Grand Caravan SE has power locks and windows, three-zone climate control, 17-inch wheels, and a 6.5-inch touchscreen infotainment system. Bluetooth is an extra-cost item, bundled with a leather-wrapped steering wheel and an auto-dimming rearview mirror. The SE comes with a second-row bench seat that doesn’t fold into the floor, but bucket seats that do stow can be fitted. The Grand Caravan SE Plus gains nicer seat upholstery, a center console and Bluetooth connectivity. At the SXT trim level, Dodge fits the Grand Caravan with a power driver’s seat, automatic headlights, a roof rack, and remote start. It’s our pick of the lineup, since it can also be configured with a heated steering wheel, heated front seats, leather upholstery, and a Garmin in-dash navigation with a 6.5-inch display. But at more than $32,000 with no options, it’s less a value than ever, considering its poor safety scores and the richer equipment lists of newer rivals. A rear-seat DVD entertainment system can be ordered for the Grand Caravan’s back seats; its 9.0-inch screen seems like a poor spend of money, since many kids have their own tablets that stream video. The 2019 Dodge Grand Caravan doesn’t lead in fuel economy, either. With fuel economy at the 20-mpg combined mark, the 2019 Grand Caravan now sits at the bottom of the minivan class. The 2018 Dodge Grand Caravan’s gas mileage checks in at an EPA-rated 17 mpg city, 25 highway, 20 combined. The Chrysler Pacifica and Honda Odyssey merit scores of 22 mpg combined; their 10-speed and 9-speed automatics help things tremendously, as do their more slippery shapes. In the case of the Pacifica Hybrid, fuel economy registers 84 MPGe, or 32 mpg combined, thanks to a big battery pack and electric motors. There’s one saving grace: The 2019 Dodge Grand Caravan can run on regular unleaded gas. Looking for a different year of the Dodge Grand Caravan?